Before using this website, be sure to read the following terms carefully. 一、In addition to reprint information, all the contents of this website belong to Shanghai Ya Dong International Freight Co., Ltd. all. 二、Any organization or individual to use this website, shall comply with the laws of People's Republic of China and the statement of this website may destroy the safety operation and shall not engage in any illegal activities using this website shall not damage the Shanghai Ya Dong International Freight Co., the legitimate rights and interests. 三、Any information and contents contained in this website, this website or without permission of the copyright owner, no other media, websites or personal reprint, copy, copy, change. Any institution or individual may, on the basis of complying with Chinese laws and this declaration, browse and download the contents of this web site for non-commercial purposes. The Shanghai Ya Dong international freight limited license, any organization or individual shall be allowed to sell to others for the purpose of profit, any use of this web site, including but not limited to such use, download, copy, store the hard copy or electronic capture system acquisition, sending, conversion, sporadic rental, demonstration, reprint, copy, modify, sales, dissemination, publication or any other form of. 四、This website respects the privacy of the vast numbers of users. We do not collect user information without the user's consent. We promise that we will not provide any third party without permission from the user for the contents of the e-mail and information of the user who is in charge of the needs of the service. ４．When the relevant laws and regulations require the disclosure of specific personal information. 五、This website is for reference only, does not constitute any advice, nor as any laws and regulations, regulatory policy basis, the user should not take the information as the basis for decision-making or reliance on such information to make legal behavior. Shanghai Ya Dong International Freight Co., Ltd. may update or update all the contents of this website at any time, but there is no guarantee. This web site strives to be accurate, complete and timely, but does not guarantee any accuracy, completeness and timeliness. For any direct or indirect use of the contents of this website and losses, including but not limited to the relevant content caused by inaccurate or incomplete, not timely loss, Shanghai Ya Dong International Freight Co. Ltd. will not bear any legal responsibility. The site does not guarantee the accuracy and integrity of the external links provided. Any organization or individual who has access to other website content through the link of this website with other websites shall assume its own risk responsibility, and Ya Dong Shanghai International Freight Co., Ltd. shall not be liable for any of the same. 六、This statement is posted on the home page and related pages of this website. This website is a solemn reminder that any organization or individual entering this website is considered fully aware, understood and accepted by the full content of this announcement. 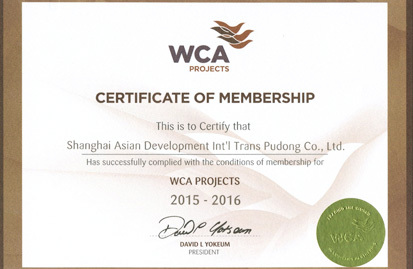 Shanghai Ya Dong International Freight Co., Ltd. reserves the right to amend and declare this statement.